Do you wish your gray flannel suit were made of sterner stuff? Do you yearn to introduce yourself with a show of force? 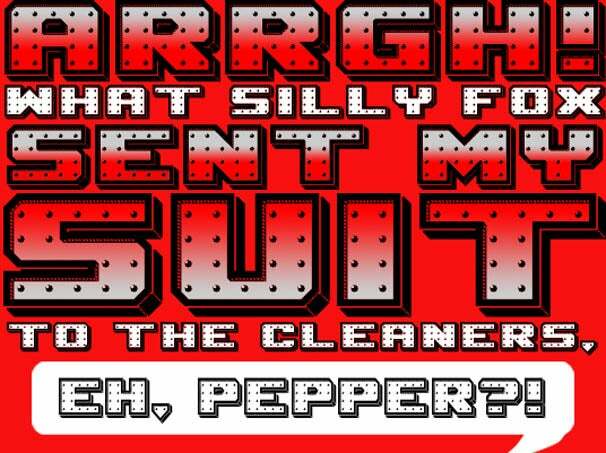 Well, shake hands with IronManic (free), designer Gene Buban's homage typeface to the cinematic Tony Stark. Quicker than you can type I AM IRON MAN, this download will have you riveted to the keyboard. IronManic was produced in 2008 using an early version of FontStruct, the modular typeface app developed by typographer Rob Meek. The tool is two-dimensional, but the amount of detail Buban rendered into IronManic's 40 characters is on par with the depth-defying tricks used by wood type engravers. Interiors sport a decorative rule creating a soldered seam effect, even as each perfectly placed rivet sports a tiny shadow of it own. Clipped endings on letters like K, R, and X help further the machine shop aesthetic. There are limitations. Users can count to infinity, but typing in lowercase is beyond the range of available characters. Start your caps at 120 points to really appreciate IronManic. The set is legible below that, but you'll miss the full-on 3D quality without the size. Like Mr. Stark's alter ego, the modus operandi of this download is to live as large as possible. While the set is meant as a tribute to Marvel Comics' armor-clad high flyer, we also see a reflection of the USS Monitor, Iron Man's Civil War ancestor. Could a loaded cannon be waiting to poke out of the Q? Be warned. Use this dynamic set for good, not evil—and please, keep it personal. Buban’s download is licensed to soar with home-use only.